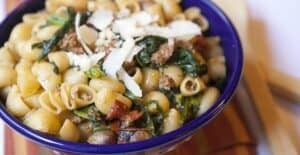 Broccoli Rabe Sausage Pasta is a classic combination of Italian flavors featuring roasted cherry tomatoes, blanched broccoli rabe and spicy Italian sausage. 1) Preheat oven to 400 degrees Fahrenheit. Chop cherry tomatoes in half and lay them out, cut side up,on a baking sheet. Sprinkle with olive oil and salt and roast for 20 minutes until they are wilted and slightly charred. Let cool. 2) Meanwhile, in a large saute pan, add sausage and a drizzle of oil over medium-low heat. Cook slowly so the fat renders out of the sausage slowly and they crisp up a bit. 3) Start a large pot of boiling water for the rabe and pasta. Season it well with salt (1 tablespoon per gallon of Kosher salt). Add broccoli rabe and blanch for 60-90 seconds until the veggie is bright green but not completely limp. Remove and let drain. Save the water for the pasta. 4) Once sausage is mostly browned all around, remove from the pan and cut into 1/4-1/2 inch coins. Return to pan along with garlic. If the pan is very dry, add a drizzle of oil. Cook for 4-5 minutes to finish cooking sausage. Stir frequently so garlic doesn’t burn. 5) Add broccoli rabe to the pan and continue to cook over medium-low heat. 6) Cook pasta according to package. 7) Add 2/3 cup of pasta water to the sausage mixture. Stir in cherry tomatoes. 8) WHen pastas is done, drain it and immediately to pan with sausage. Season with fresh oregano, salt, and pepper. 9) Toss ingredients together and serve immediately with parmesan cheese. This delicious recipe was brought to you by Macheesmo. Read the full post at https://wp.me/pkSYO-9sc.